“Salt Removers Solution” is just that, a solution. Spearheaded by the founder of the company, Scott Waldrop, after having to replace his own system due to sea salt corrosion after only four years of service, and having the basic knowledge of knowing that his inland system (sea salt free) was 12 years old and still working trouble free, he knew there had to be a better way. Eliminate high repair and replacement costs – While many units come standard with a 10 year warranty, these warranties specifically exclude sea salt corrosion within a coastal environment. Costs to repair or replace your unit due to the rapid corrosion caused by sea salt can be extremely high. Save yourself a bundle by using Air Conditioner Salt Remover. Quick and easy removal of sea salt deposits from your coastal Air Conditioner or Heat Pump will automatically increase the life and efficiency of your system. 100% Non-Toxic, Safe for People, Pets, and the Planet! Start Making a Difference Today! At Salt Removers, we are striving to educate the coastal homeowner about the preventable financial burden of sea salt in relation to your homes air conditioner or heat pump and to let you know that Now! there is a cost effective solution. We simply want to provide you with a commercial strength, easy to use salt removal solution that’s specifically engineered to safely remove corrosion causing, energy depleting sea salt deposits from your coastal homes largest energy consuming appliance. Our goal is to Save You Time, Money and Aggravation, while keeping your home comfortable; both economically and socially responsible. There Is A Better Way…Guaranteed! Our approach is to provide you with a solution for the sea salt and corrosion that’s affecting your coastal heating & cooling system.. We want to provide you with a cost effective, easy-to-use, salt removal solution that’s specifically engineered to increase the life and efficiency of your system, and leave you completely satisfied with the results. We have strived to develop a product and homeowner friendly delivery system that will produce savings far above the products cost… Guaranteed! 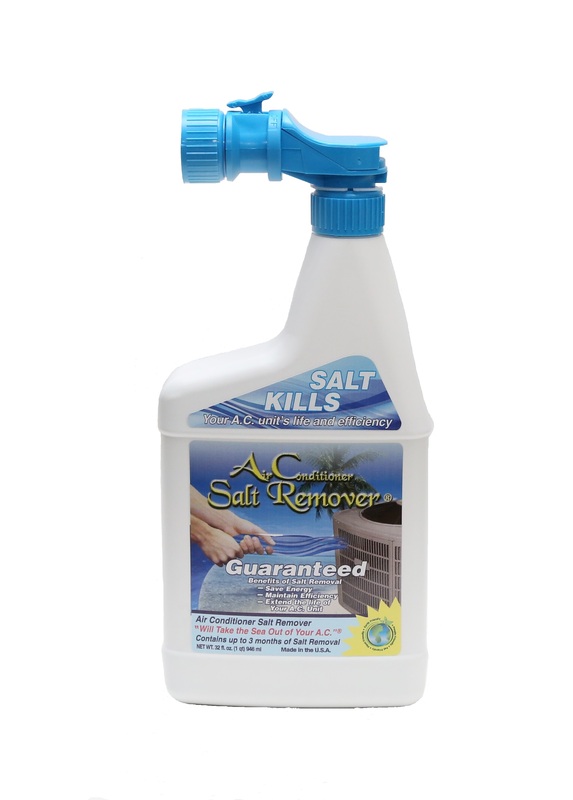 Salt Removers has not only developed a solution for sea salt corrosion to your coastal air conditioner or heat pump, but have also exposed the continual and unnecessary monthly financial burden (power bill) caused by sea salt. Currently, we are the only company that focuses 100% of our time, research and attention to increasing the life and efficiency of your coastal homes- largest and greatest- energy consuming appliance, your air conditioner or heat pump. Unlike coil coatings, our revolutionary salt removal solution removes the problem, allowing the unit to achieve complete thermal transfer as their designed to do. We do not want you to replace your system, our goal is to keep you from having to prematurely replace your system and Save You Time, Money and frustration throughout. We’ve Been There…We Know How It Feels! Take Control of this Recurring Financial Burden. Now! You have the ability to do something. Easy-To-Use. Remember, If You Can Operate a Garden Hose…Then You Can Do This!